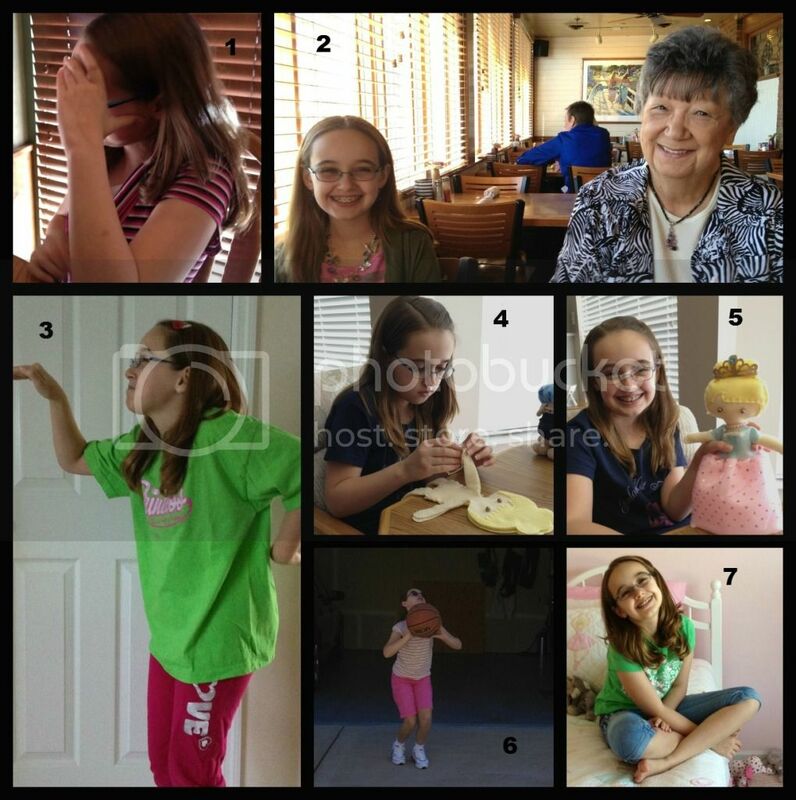 Our last couple of weeks have been just a whirlwind blur since Amber's remaining activities started up. Who knew it would make such a difference in our schedule? We've had some fun times, and some very difficult days these last two weeks. There was one day in particular, last week, that I just could not take any more. It was such a day that I took my phone out, opened the contact for her old parochial school, and was ready to call. Just one little touch to the number and I would be connected to the school again. The only thing that stopped me from registering her was that I didn't really want to drive her into school the next morning. Sad, honestly. On the other hand, some days have gone so smoothly that we finished hours ahead of schedule, leaving the rest of the day free for whatever activity Amber requested. I LOVED those days. 1. Embarrassed by her mother. She was trying to embarrass me in one of our favorite restaurants, instead I got her by dancing in my chair. 3. Amber "walking like an Egyptian". 6. Basketball for recess. We did this all week long too. 7. Being goofy in her room with stuffed animals strewn about the floor. I've been trying to incorporate more outside recess each day since the weather turned seasonably cool. Amber isn't always appreciative of my efforts, but this is Missouri and we don't often have nice outside weather. We still haven't gotten around to doing any kind of nature study. Sheesh, you'd think we could get our act together by now. Our school subjects have been trekking along with no hiccups, and we are mostly on schedule for the year still. I did decide that Amber would benefit from a timeline in both history and Art / Music appreciation. The timeframe of many events doesn't seem to be clicking in her brain, and she is such a visual learner that I believe working on the timeline will help. It will also let her be a little more creative without feeling the pressure of Art class. She is still so adamant that she is not interested in formal art classes. The art class at her last school really took away her confidence in anything creative. 2. With the "motto" that Amber devised, on the t-shirt back. 3. Actual school work happening. Woohoo! 4. Pedologist lab - she isn't happy holding all the dirt. After looking around for a good timeline download, app, or just anything to make it more interesting than "a line Mommy drew on paper", I found Wonders of Old Timeline Book by Knowledge Quest. It is pretty pricey for a the type of project I want to do, and I really wanted something we could re-use for multiple subjects and years. However, they do have a CD-ROM version that is slightly less and a downloadable version that turned out to be only $10. I went with the download version and we are tickled pink with it. Wonders of Old has timelines for 4 historical periods and comes with printable stickers to use when classifying the events. I did also consider purchasing timeline figures, but I would prefer Amber to be a little creative and make her own drawings, even if they are stick people. The download version of Wonders of Old is my favorite resource this week. Amber started back at dance last week and has thoroughly enjoyed every single class so far, even though it has played havoc with our schedule. 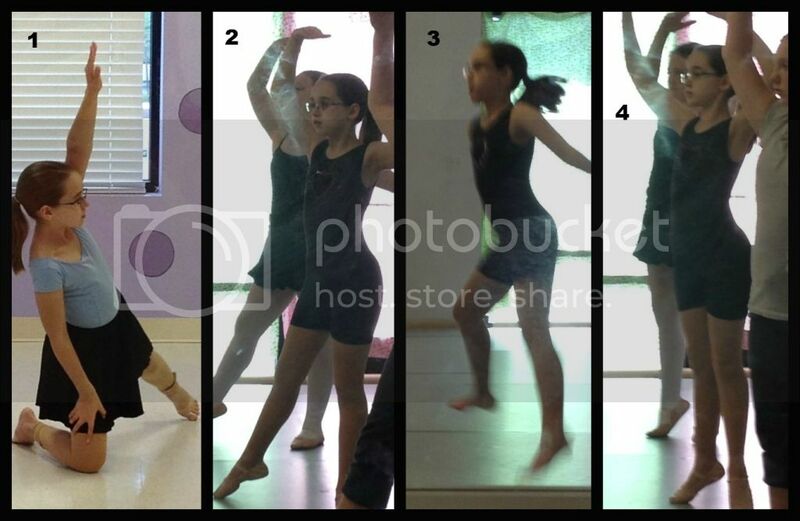 Her private dance lessons don't start until October, but she still has 5 dance classes throughout the week. We've also added voice lessons, for the first time. It was supposed to be group lessons, but Amber is the only person signed up right now. So, it's private voice lessons for the price of a group lesson for a little while, at least. 2. Ballet - how pretty. 3. Leaps and Turns. Just wish I was better at catching the leaps. No pics of Jazz, Tap or her private lessons. I'm a bad dance mommy. Today, Amber is in high anticipation for a promised fun event - we are taking Amber to her first rock concert! The concert almost didn't happen though. We've had tickets since the pre-order went up on Rush's website back in very early May. However, Thursday night Amber fell off her stool while feeding the gerbil and hit her jaw / mouth on the gerbil cage, then the counter, then landed on the floor. She seemed mostly okay that night, except for a few scratches inside her mouth from the braces. But Friday things looked bad. The whole right side of her face was red and swollen and very tender to the touch. She was taking Advil and using ice. We ended up at her doctor, who truly thought it was a fractured jaw bone and sent us on to the hospital for panoramic xrays. We spent HOURS in the ER on Friday afternoon / evening to find out she had a bruised bone. She looks like she's been in a brawl, but it should heal in a week. So, the Rush concert is back on! 2. After hospital ordeal. Relaxing before bed with very large jaw. 3. Wearing a borrowed RUSH t-shirt from Mommy. Ready for her first concert. I'll try to post pics from Amber's very first rock concert later this week. I hope you all have a great weekend and that your weekend started out better than ours! I was wondering how things were going with you girls. I am so sorry you had a hard day. We have those at times too. 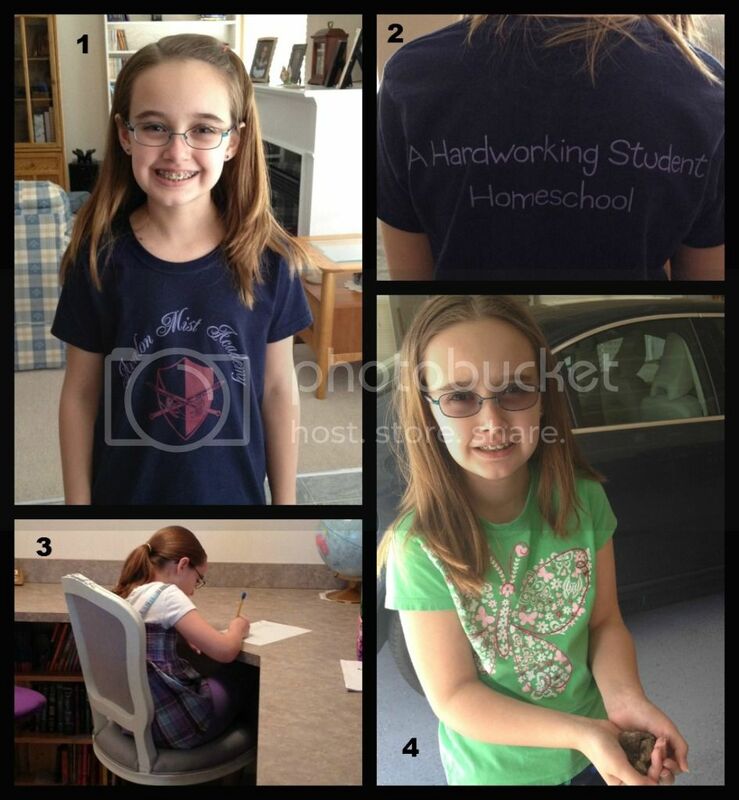 Love her homeschool t-shirt! Dance lessons look great! Oh no about the jaw! Poor Amber. So glad to hear it is just bruised. Can't wait to see the concert pics. I was so short on time the last couple of weeks and I've been trying to make sure I get my workouts in. I feel so much better when I exercise daily. Amber's face is a pretty yellow today, but she also can eat more than soup, mashed potatoes and ice cream. Our Rush pics didn't come out great but I have a few. I need to clean them up a little bit first. Wow...what a busy week! It stinks that you had such a bad day, but it seems like you recovered OK. I hope this week is off to a good start. Thanks for linking up at Favorite Resources. It sounds like you will enjoy the timeline.